Sonny is scared about disappearing in the dark. Which is why he always tries to stay awake for as long as he can. But tonight, there are noises coming from the shadows. The sounds creep closer and closer, and suddenly Sonny finds himself in the middle of a pitch-black tornado. But in the darkness, he is introduced to Natalia. At the same time he is also introduced to courage. 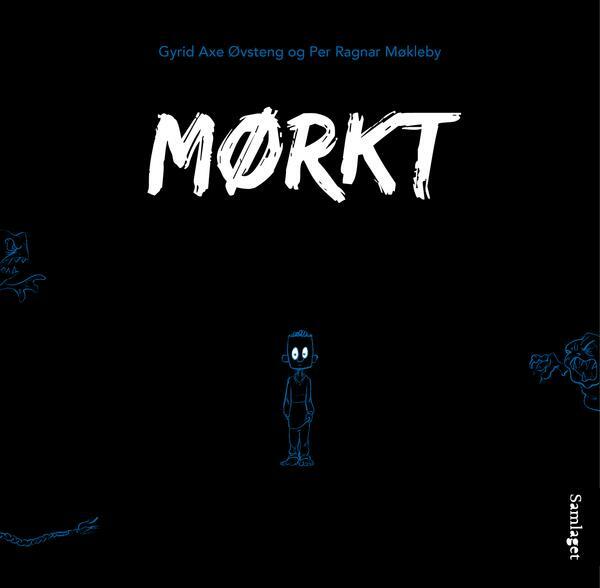 Once again, the prize-winning pair, Gyrid Axe Øvsteng and Per Ragnar Møkleby, have put together a bombastic storyline, based on touching themes. In Dark, the duo tackle fear in an utterly original way. After all, what do you do when the worst possible thing that could happen, actually happens? Follow Sonny into the darkness to find out. Complete English translation is available. Gyrid Axe Øvsteng (b. 1974) is an author and dramatist. She had her fiction debut in 2009 with her picture book Finn! She also holds qualifications in both theatre and Nordic studies. Per Ragnar Møkleby (b. 1974) is an illustrator and a graphic artist. Møkleby has made several books together with Øvsteng. For their 2013 work, Førstemamma på Mars (First Mummy on Mars), they shared the Norwegian Ministry of Culture’s Best Book Prize as well as the Norwegian Critic’s prize for the best book for children and young people. Translation rights: Sold to China. Neste Neste innlegg: Trude Tjensvold: DO YOU WANT A CAT?